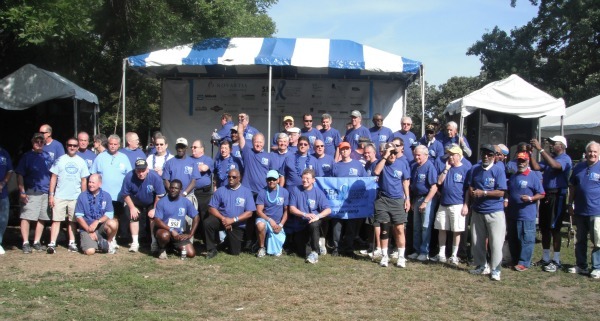 So many prostate cancer survivors, not everyone fit on-screen! There's a first time for everything. First run, first marathon, first bike ride using clipless pedals, first open water swim...you get the idea. But here's a new first that I added to my list: unintentionally running an extra mile during a race. I know people who have run a 5K loop twice to log extra mileage. I remember listening to disgruntled runners at the finish line of the now-defunct Lakeshore Marathon after being directed to run 27 miles. I have a friend who missed the turn-off to the Steelhead 70.3's two-loop run course and the routine 1:30ish half-marathoner turned in a 1:50 split. Even I ran a 3.45-mile 5K when last year's Hot Chocolate 5K was briefly delayed and rerouted to avoid the semi that got stuck on the course. But everyone running that Hot Chocolate 5K ran extra mileage; our times showed it and the race organizers used a metric to approximate our would-be 5K times. Not everyone running the SEA Blue Prostate Cancer Walk/Run on Sunday ran a 5K. Make that everyone but me and another runner. I missed the human turnaround cone and kept running. My 5K, which was really all my legs wanted to run Sunday morning a week removed from Ironman, turned into almost four miles. I run the Lakefront Path all the time, I have routes mapped in my head for various distances (perfect for when I'm too impatient to wait for the satellites to locate on my Garmin), and I'll never be a lead runner (even if I'm lucky enough to be the first female because the fast ladies are elsewhere, there will always be guys in front because I'm just not that fast). Yet on this idyllic morning, I ran to another race's two-mile mark before turning around. I already knew I was running too far, and the thought crossed my mind to arbitrarily turn around. But there were two voices echoing in my head (or at least that's the only way I can seem to rationalize what happened): The voice that was telling me to keep running and the one that didn't want me to be responsible for all the runners behind potentially cutting the course if that's indeed what I was doing. You could blame the runner's high--that I was too zoned into running to realize how far I was going--but I'm blaming the human cone. Talking cones aren't much good when they're not traffic-directing cones nor repeating, or signaling, a turn, and instead they're talking about the race and possibly getting distracted by those stopping at the water station (which I would be too especially if a non-racer helped herself to the race water station as is what happened directly in front of me). And within seconds my position went from second female to chasing down the crowd. Sure, I told the human cone that he didn't tell me to turn around as I ran by; I wanted him to know of his mistake. And sure, I was a little disappointed when the race went from good to bad--and my pace went with it. And sure, I really didn't want to see that 31-minute finish time when I knew I had a good chance of placing near the top with many other runners at the Bucktown 5K or the Ready to Run 20-Miler. But it turned out that it was easier than I thought it would be to put all of those thoughts aside and remember the cause. I wasn't there to win the race or nab a PR--granted either of those would have been awesome though rather unrealistic a week after my big race of the year. I was there to support SEA Blue, Us Too and the Wellness Place--and all of the prostate cancer survivors, their families and the people memorializing those who lost their lives to the disease--in the way that I could...by running. I knew that while I was running, but it became even more obvious after I crossed the finish line. The survivors gathered in front of the stage for a picture--a crowd of men of all ages beaming. You couldn't help but want to take a picture (which I did, above). And before I was about to head home, I started talking to one of these men, a survivor who asked me about my run and commented on the beautiful morning. As he shared his story, a former runner who worked for the YMCA before retiring, I knew why I ran that morning. I left with a smile, wishing I had known about this race before this year (who knew that it was 8 years old or I would have run just like I used to do the Y-Me race against breast cancer) and remembering the cause, never mind the course mishap. Note: Don't let my mishap deter you from participating. This race truly was a special experience and I'd run it again, extra mileage included. Have you ever over-run a race? Did it make you run faster to the finish line, get angry or lose you motivation (which we hope didn't happen)? How did you deal with it?